And Mao is still popular in Communist China, even though his country is now one of the most dynamic capitalist countries on Earth. The Chinese may have given up on the Marxist ideology, but they haven’t given up on the imagery of the revolution. The exploits of the Red Army are still celebrated. Mao’s myth is still alive and well despite the large number of Chinese deaths for which he was responsible. There is even a Cultural Revolution themed restaurant where staff dressed as Red Guards prance around waving red flags. Some people regard Mao as the biggest mass murderer in history. This might be disputed, but he is certainly the cuddliest. To be fair Mao took over from a situation of chaos and civil war that had been raging for seventy years, so maybe that explains and even partially justifies his actions. Given that one of his actions was to eliminate 10,000 fellow party members who he found politically difficult, it does need some justification. But China was truly on its knees. By 1949 the peasants, who were the huge bulk of the population, were probably worse off than at any time in China’s 2000 year history. It was a situation that called for drastic measures, and drastic measures were exactly what Mao took. He confiscated the land of the big landlords, and executed a lot of the landlords themselves. He then created a system of government so pervasive that it could keep a grip on the whole society. The party took over the control the previous ruling class used to wield, and then ratcheted up a notch. Party officials were sent into every village. They are still there, and they are still influential. They pass information both ways, explaining the party’s policies to the people, and reporting dissent back to the authorities. This level of control allowed the people to be mobilised for huge projects to build China up to restore the position it once held in the world. The trouble was that the projects Mao came up with didn’t initially seem to do much good. The land reform got off to a good start. Peasants were given land for the first time in China’s history. But it didn’t last. In 1958 the land was collectivised. Communist China got its communes. This was the start of the Great Leap Forward. Robbed of individual incentives and diverted onto the building work for industrialisation projects food production was neglected. Grain production started to fall. The grain that was produced was allocated to the cities, and the people in the countryside started to starve. Up to 70% of the population of some villages died for lack of food. There were even cases of cannibalism reported. The total deaths might have been as high as 45 million. When the Great Leap Forward proved disastrous Mao ran into opposition within the party itself. His response was the Cultural Revolution. It started with a surreal photo opportunity. At 73 Mao swam in the Yangste river and then set up the Red Guards. Young Chinese formed into groups, grasped their copy of Mao’s little red book, and went out to purge the capitalist elements still left over from the revolution. This included a large number of intellectuals. Many were killed, others re-educated. It also got rid of Mao’s opponents and established Mao’s cult of personality. Red Guards ran out of enemies to terrorise and fought with each other. And yet Mao remains enormously popular in China. People queue up to take photos at his statue. 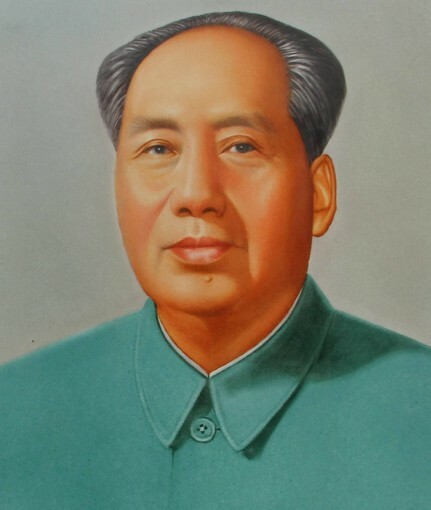 Mao’s photographer knew him well and doesn’t have a bad word to say about him. Songs like ‘Chairman Mao is the Sun that never sets’ from the period are still sung. It is all very hard to explain. Much of it may simply reflect a successful propaganda effort. The party maintains its grip on information so the Great Leap Forward has been airbrushed out of history. Deng Xiaoping took over when Mao died. He had long been an advocate of freeing up the economy, which had got him into trouble with the Great Helmsman. But once he got his own hand on the helm he steered the country in a different direction. Agricultural collectivisation was reversed. Deng was famously easy going about the colour of cats. They could be black or white as far as he was concerned so long as they caught mice. It might not be strictly socialist, but he allowed market forces to work their magic in building the economy. But he kept the party apparatus and its ability to control of society. It was a winning combination, and economic growth took off almost straight away. China’s economy had been growing under Mao, but with Deng’s policies the growth increased. It has continued ever since until now China is only a few decades at most from becoming the world’s largest economy. With economic growth came demands for more democracy. But as the 1989 events in Tiananmen square Square showed, the party was not going to accept that. The students calling for democracy were violently suppressed. Mass party mobilisation is still a big part of the mix, China is not simply a capitalist economy. Many things can be pushed through in China that would be impossible in the West with its legal protections for workers and the environment. An apologist for the party would say that progress is only possible because of the way the party keeps everything firmly under control. This was a really interesting and well made programme. I can’t really fault it, though I would have liked a bit more about Mao’s personality. In next week’s show we’ll be hearing about the future of China. I am hoping we are going to get an answer to the question posed at the beginning of this one. It should be compulsive viewing. And this is my review of his last series Is the West History? That is interesting Long Marcher. I had no idea about that. It puts a bit of a different perspective on Mao doesn't it.